This is a very strange place... So be prepared for terrible monsters! 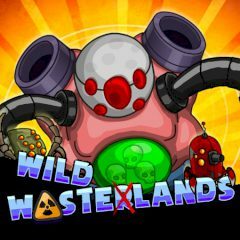 Help the brave hero to kill all the monsters and become the true king of the wasteland! Do not forget to buy upgrades, and enjoy the game. It's really amazing! Cause this time you are going to kill a lot of monsters and just stay alive as long as possible. Well, do you think that it is so easy? So, just control him and move the mouse. He will shoot automatically. Try to collect as much bonuses as you can and get a lot of money for you upgrades. Could you believe that? Then just buy a lot of upgrades and kill all the monsters and their bosses. It is so easy! Just have faith in yourself and help this brave guy. Are you ready for such an exciting challenging game? I wish you good luck here.